I originally wanted to make a dress out of the lovely silk twill you see in the photos (this exact dress and pant set in fact). Silk twill is actually very similar to CDC but ever so slightly heavier. It drapes and feels much the same, but is basically just less see-through in my opinion. And this makes it perfectly suited to a jumpsuit. I know there are heaps of totally fabulous jumpsuits doing the rounds right now in blogland. I’ve also made a few myself in the past year (here and here). My version is a mash up of two vintage patterns: McCall’s 6429 and Style 3304. 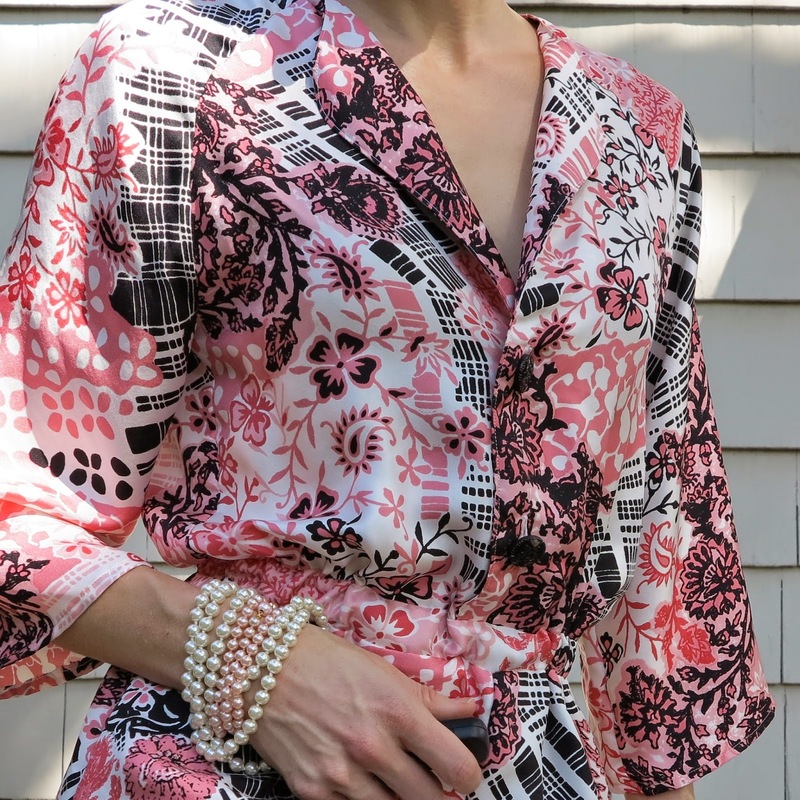 I’ve used Style 3304 in the past (here and here), so I took the bottom half of this pattern and connected it with the top half of McCall’s 6429. The silk is Oscar de la Renta. I’m obviously partial to a bit of Oscar, since he features quite well in my stash. The top is fastened with two black glass buttons. Initially, I made the jumpsuit complete with the full collar you see on the pattern packet (instagram photo here) but it just didn’t look right when I tried it on. The look was too silk-pyjama-esque. I fixed this by unpicking the collar and leaving the facing intact. I toyed with creating a V-neck but I liked the little lapels better. Anyway, to sum it up, I’m pretty happy with this make. It was a bit random and I’m not entirely sure how hubby will take it. I think I’m just going to have to book a date night and surprise him (or ply him with spirits if I have to). Because seriously, these pants are made for dancing! This entry was posted in jumpsuit, McCall's 6429, Mood, Oscar De La Renta, playsuit, silk, Style 3304, twill on September 19, 2014 by Debbie Iles.